Rugged & Strong Material For Longer Life. Has spikes on the base that prevents water logging. Cipla Plast is a company that has been causing revolution with its innovative and elegant bathroom accessories & domestic items. The company was setup mere fifteen years back but with its high standards of quality and never seen before design it’s already touching pinnacle of success. It has been successfully endowing with such appealing ideas that not only impress but also are so unique in their making that its hard not to acquire one. The lifetime trouble free smooth movement and ample storage capacity of its products highlights utility factor making it more desirable, apart from radiating aura and providing your bathroom with most advent charm. Moreover in a particular category the article is made of same measurements so that one can easily replace with another with utmost ease. The sole purpose of Cipla Plast is to bestow you with maximum space in minimum place, so that you can make more use out of your bathroom then you ever through of. 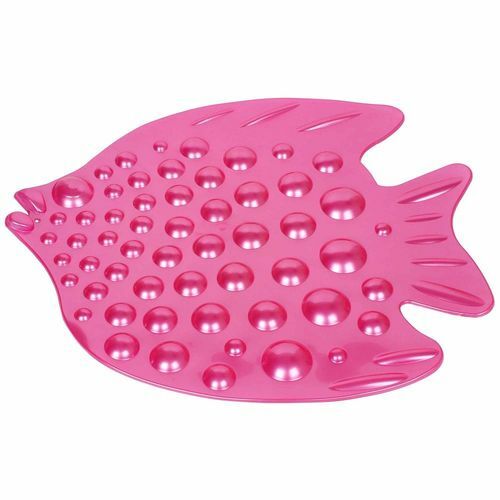 Cipla Plast Anti Slip Rubber Tub Mat/Bath Mat - Fish Features Unique Fish Designer Mat To Prevent You From Slipping On Bath Floor Rugged & Strong Material For Longer Life Easy To Wash And Clean Soft Grip And Surface Specifications: Made of heavy duty PVC Anti-slip bath mat Shaped like a fish Has spikes on the base that prevents water logging Available in 3 Colors: Blue Pink Green Golden Cipla Plast is a company that has been causing revolution with its innovative and elegant bathroom accessories & domestic items. The company was setup mere fifteen years back but with its high standards of quality and never seen before design it’s already touching pinnacle of success. It has been successfully endowing with such appealing ideas that not only impress but also are so unique in their making that its hard not to acquire one. The lifetime trouble free smooth movement and ample storage capacity of its products highlights utility factor making it more desirable, apart from radiating aura and providing your bathroom with most advent charm. Moreover in a particular category the article is made of same measurements so that one can easily replace with another with utmost ease. The sole purpose of Cipla Plast is to bestow you with maximum space in minimum place, so that you can make more use out of your bathroom then you ever through of.